William Collins - The storyteller, 1843 - Online gallery supplying original fine art. Trending Modern British and Contemporary Welsh. Available for sale from Big Sky Fine Art; this original oil painting by William Collins dated 1843.<br> The painting is presented and supplied in a mid 20th century ornate frame.<br> The painting signed and dated 1843 lower left.<br> <br> The painted surface and canvas have benefitted from some restoration including a small hole repair, cleaning and conservation, which took place in 2010 on our instructions. The repair is permanent and has been professionally performed by a recognized conservation restorer. The repair is not visible from the front but is evident on the rear.<br> <br> William Collins was one of the best known and most popular artists of his time. He was born in London and studied under the guidance of his father, a picture dealer, and was also taught by the artist George Morland. He studied at the Royal Academy in 1807 and gained a silver medal for his life drawings there. When his father died, his family were impoverished and he painted to support them. His works were popular, showing homely scenes of a tender sentiment and often depicting children from a rural background. He travelled around Europe, principally Italy, and though his style developed because of this his most popular works remained those of English coastal and rural scenes. He was elected as Associate of the Royal Academy in 1814 and became a member in 1820. He exhibited in the Royal Academy and British Institute many times and has works are held in several of the major English galleries. Collins was a younger contemporary of JMW Turner and John Constable and in his time his works were more collectable; he became a favourite of high profile patrons including King George IV and the Prime Minister, Sir Robert Peel. 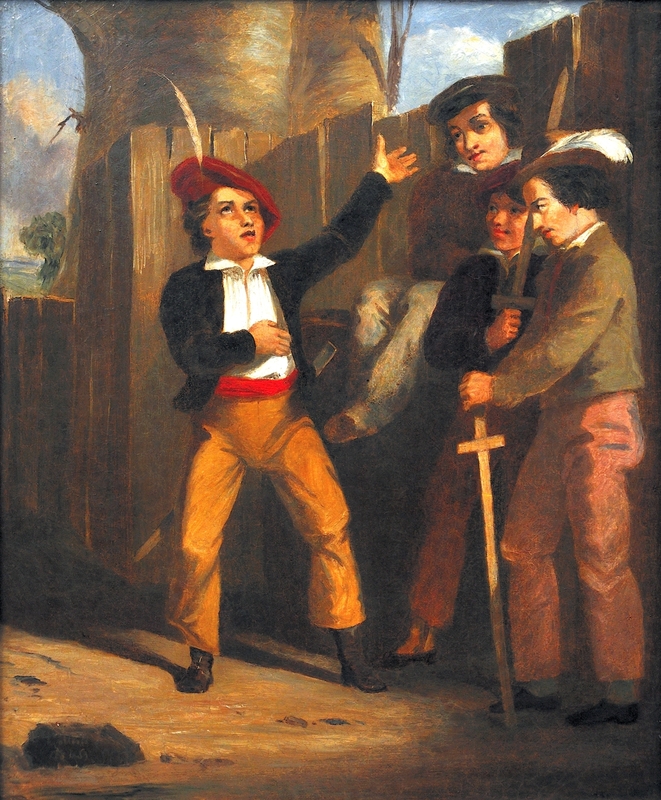 Nowadays his works are harder to find.<br> <br> This original oil on canvas painted in 1843 depicts a young man regaling his friends, no doubt with tales of heroism, though we suspect bravado. He is wearing brown boots, yellow breaches, a white shirt, black jacket and a soft red hat with a white feather in it. He gestures in a dramatic way and rolls his eyes skyward as he tells his tales. His three friends listen in apparent amusement, two of them holding wooden, perhaps homemade, swords. Behind the group is a tall wooden fence, on which one of the friends is perched. Behind that is the broad trunk of a tree, and blue sky beyond. The overall scene is a charming one of good humour. Available for sale from Big Sky Fine Art; this original oil painting by William Collins dated 1843. The painting is presented and supplied in a mid 20th century ornate frame. The painting signed and dated 1843 lower left. The painted surface and canvas have benefitted from some restoration including a small hole repair, cleaning and conservation, which took place in 2010 on our instructions. The repair is permanent and has been professionally performed by a recognized conservation restorer. The repair is not visible from the front but is evident on the rear. William Collins was one of the best known and most popular artists of his time. He was born in London and studied under the guidance of his father, a picture dealer, and was also taught by the artist George Morland. He studied at the Royal Academy in 1807 and gained a silver medal for his life drawings there. When his father died, his family were impoverished and he painted to support them. His works were popular, showing homely scenes of a tender sentiment and often depicting children from a rural background. He travelled around Europe, principally Italy, and though his style developed because of this his most popular works remained those of English coastal and rural scenes. He was elected as Associate of the Royal Academy in 1814 and became a member in 1820. He exhibited in the Royal Academy and British Institute many times and has works are held in several of the major English galleries. Collins was a younger contemporary of JMW Turner and John Constable and in his time his works were more collectable; he became a favourite of high profile patrons including King George IV and the Prime Minister, Sir Robert Peel. Nowadays his works are harder to find. This original oil on canvas painted in 1843 depicts a young man regaling his friends, no doubt with tales of heroism, though we suspect bravado. He is wearing brown boots, yellow breaches, a white shirt, black jacket and a soft red hat with a white feather in it. He gestures in a dramatic way and rolls his eyes skyward as he tells his tales. His three friends listen in apparent amusement, two of them holding wooden, perhaps homemade, swords. Behind the group is a tall wooden fence, on which one of the friends is perched. Behind that is the broad trunk of a tree, and blue sky beyond. The overall scene is a charming one of good humour.